When the hot weather approaches Mrs. CBB and I have an incessant urge to eat lots more vegetables and fresh salads and this tangy easy guacamole is no exception. I first fell in love with guacamole after tasting the Indian version while in India a few years back. 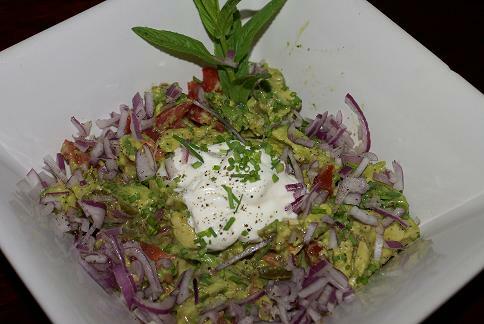 My recipe is not near as fancy as the Avocado Raita nor as authentic as the Mexican version but it’s tasty and is just as addictive. There are many reasons to eat more avocados if not for the high fat content(14.1 g of fat in a half avocado-mostly unsaturated with 2 grams saturated) but for the heart healthy vitamins. I like to serve my guacamole with tortilla chips, fresh-cut vegetables or on my homemade whole wheat tortillas (I promise you will never buy them again they are so easy to make), which I will be sharing with you shortly. Guacamole is a relatively frugal dip to make with the real cost coming from the avocados running about $1.25 each or cheaper depending where you buy them. We picked up a pack of 6 for $2.99 on the reduced rack last week so we’ve been making this guacamole recipe over and over for about $4.10. With BBQ season in our face and backyard parties filling up the calendar this dip is easy on the budget and perfect for any gathering or potluck. In a bowl mash the avocados with a fork but keep them a bit chunky. Enjoy your Guacamole Dip!… and don’t miss my whole wheat tortilla recipe… it’s perfect with this dip! My boyfriend locked me out of my facebook while I study for the bar:[ I am on Pinterest though, it is my daily guilty pleasure. I rarely even have time to blog these days. I will keep an eye out for your posts! I read a lot of things and don’t take the time to comment because I am so daffy and busy these days. I’m sure you know what’s more important right now and I agree studying for the bar trumps FB anyday. Good luck when do you write? OOH that looks so good!!!! I love adding greek yogurt into my guac or using greek yogurt instead of sour cream. Try it! You won’t notice a difference.